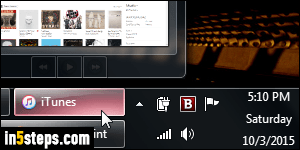 By default, iTunes for PC minimizes itself to the taskbar, like any other program. But it includes a setting that lets you hide iTunes' main window once you minimize it. 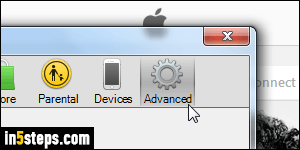 This tutorial shows you how to enable minimizing iTunes to the system tray (notification area of the taskbar) in Windows 7 / 8 / 10 / Vista. From iTunes, click on the Edit menu and choose "Preferences". If you didn't enable iTunes' classic menus (which makes them match those on Mac OS X), click on the menu button in the top left corner and choose Preferences. Tip: you can quickly access Preferences with the Ctrl+, keyboard shortcut! Select the "Advanced" options at the top. First, check the "Show iTunes icon in system tray" checkbox at the bottom: with that setting alone, you get the iTunes logo next to the system clock, but it won't do much. You can right-click on it to Show iTunes or Exit. 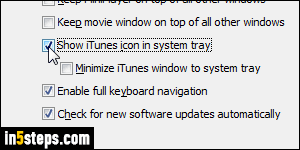 Now check the "Minimize iTunes window to system tray" checkbox as well and click OK. 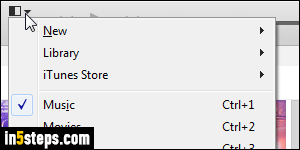 Minimize iTunes: its window will become invisible, and its taskbar button will disappear. Depending on your settings, that icon might be visible or not: if needed, see how you can make a system tray icon always visible. Otherwise, click on the arrow button to show hidden icons, one of which is iTunes. 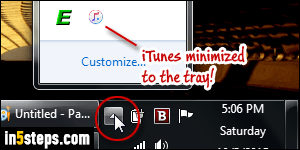 This setting is awesome while working on your desktop PC or laptop: you can quickly access iTunes, but it's out of your way while you don't need it!